Fun & Informative Hideout for Hamster Lovers. This site contains movies, all sorts of information on hamsters, stories, picture galleries, games, wallpapers, ecards, free email ... and more! There is also an active and informative forum on this site. All the Hamster information you need from Syrian hamsters to Dwarves. Includes a webcamforum, hamster gallery and lots of info on Hamster Care. Robo Care Central. Al sorts of information on keeping roborovskis and lots of photos and a few movies. Momentarily off-line due to bandwidth stealing (direct linking). Beautiful wallpapers of Roborovskis and other dwarf hamsters. Private pet rehoming project located in Zaandam, The Netherlands. There still are animal lovers with a mission! My favourite hamster related forum!! Friendly hamster lovers and big community. Main language Dutch, though questions in English will be answered. Live webcam of a hamster! Cute site with lots of hamster pict. 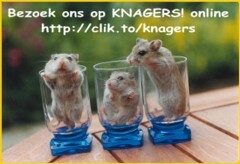 Website with very nice illustrations of hamsters (scroll down and choose a page next to "illustrations"
• Brigitte from The Netherlands. Brigitte provided the beautiful series of photos of the diluted white face and their progressive color fading. • Fenna from Belgium. Fenna provided the base photos for the gender comparison. • Henriëtte from The Netherlands. Henriëtte provided photos for the breeding sections, as well as photos of white face Roborovskis and of Roborovskis living on sand. • K. Akagami from Japan. He made some of the beautiful Roborovski photographs which I used in the care sections. • Loes from The Netherlands. Loes also provided a lot of the photos in the breeding sections. • Monique from The Netherlands. Monique provided the photos of the normal colored Roborovskis producing a white face pup.